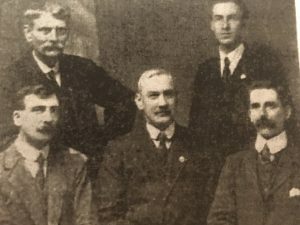 With the centenary of the Manx General Strike due to be commemorated in July, the story brings into focus some of the deprivation suffered by local people at that time and the strenuous efforts of those who formed trade unions to push for reform. 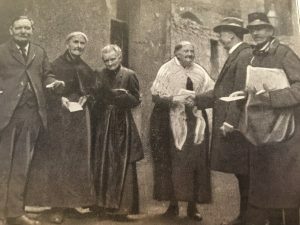 As the working class began to emerge during the nineteenth century, responsibility for the poor, sick and elderly was firmly placed within the family, with assistance from the church where necessary. But a rapid growth in population overwhelmed their work, which was later undertaken by a proliferation of what became known as ‘friendly societies’. The first recorded attempt to form a trade union on the Isle of Man was in 1821, but it wasn’t until the turn of the nineteenth century that serious attempts were made to organise sections of the working class into a positive force. During 1917 efforts were made to organise a union of general workers against a backdrop of an unprecedented rise in the cost of living and an undefined working week; attracting considerable support. There was a tangible stirring of discontent with the Island’s Governor, Lord Raglan, the previous year, when he opposed the introduction of pensions for the elderly and direct taxation. 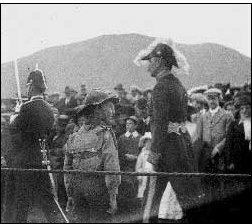 This was an unpopular decision and during the Tynwald ceremony of 1916 he was confronted by placard wielding demonstrators demanding his resignation, and famously struck by a grass sod thrown by a member of the crowd. Their anger was further fuelled by the Manx government’s refusal to implement a flour subsidy for Island bakers in parity with England. A temporary equality was agreed after protesters applied pressure, but it’s termination did little to dampen their anger. Lord Raglan decreed that a fixed price should be applied, but local bakers threatened closure, protesting that they couldn’t produce bread at this price. This action then set in motion a series of events which ultimately brought the Isle of Man to a grinding halt. 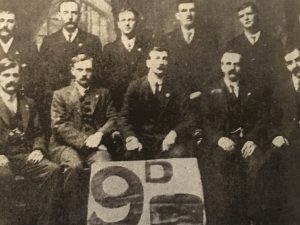 A strike committee was appointed with representatives from local unions, and a thousand people gathered outside government office to announce an impending strike which affected the Island 3rd – 5th July, 1918. Its success lay in skilful organisation which rapidly halted key components of daily life. Schools, shops, offices and factories were shut down and cargo workers ceased work. The strike committee did allow fishing boats to land their catch at a price fixed by them and food shops in poorer districts opened for limited hours. Tram and rail services were non-existent, and although there was a boat in the morning, it didn’t return. 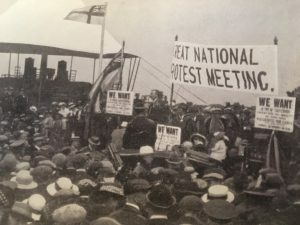 The strikers were now in a commanding position, having taken the government by surprise, and those who resisted the demands of the strike committee received short shrift. A request for members of Tynwald to be allowed to travel to the annual Tynwald ceremony was put to the strike committee, but Lord Raglan postponed the event fearing disorder and demonstration. Stranded visitors also approached the Governor for assistance to travel home, including asking for a warship, but their requests met with no action. The matter was finally resolved when the Governor met with the Legislative Council and it was agreed to restore the ‘ninepenny loaf’ with immediate effect. The imposition of local income tax and pensions followed. There were repercussions for some strikers, but ultimately Island trade unions and political labour representation was strengthened. Lord Raglan resigned his position as Governor on the 17th December, 1918, citing ill health. Author and historian, Dr John Callow, expanded on the theme of the Manx General Strike during an absorbing lecture at the Manx Museum Lecture Theatre, where he probed deeper into the subject and emphasised the extraordinary success of the event. A limited edition First Day Cover commemorating the centenary is available from Isle of Man Stamps and Coins at £15.